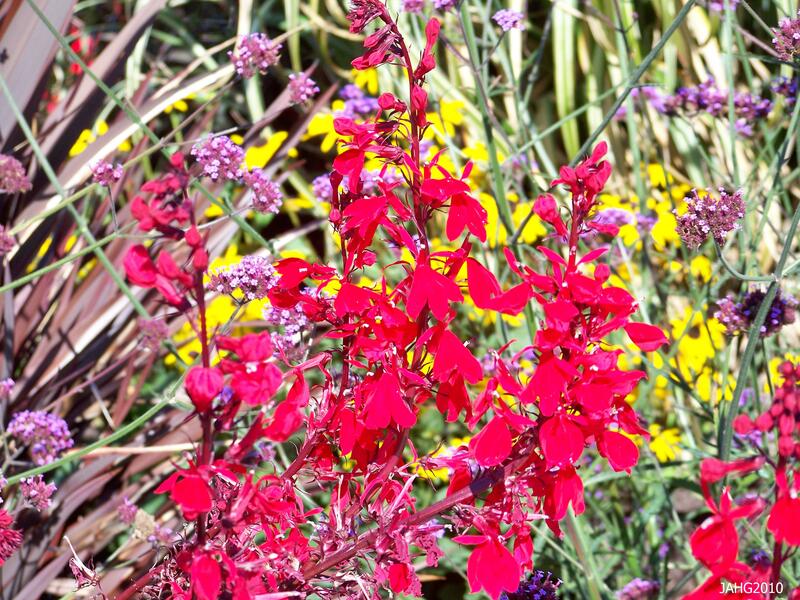 Bright, Rosy Twinkles in the Garden. This week it has taken a turn for fall the sun shines and the nights are much cooler. Finally there are touches of color developing in the leaves of trees, in the next few weeks the show of yellow, red and orange will be at their peak here. 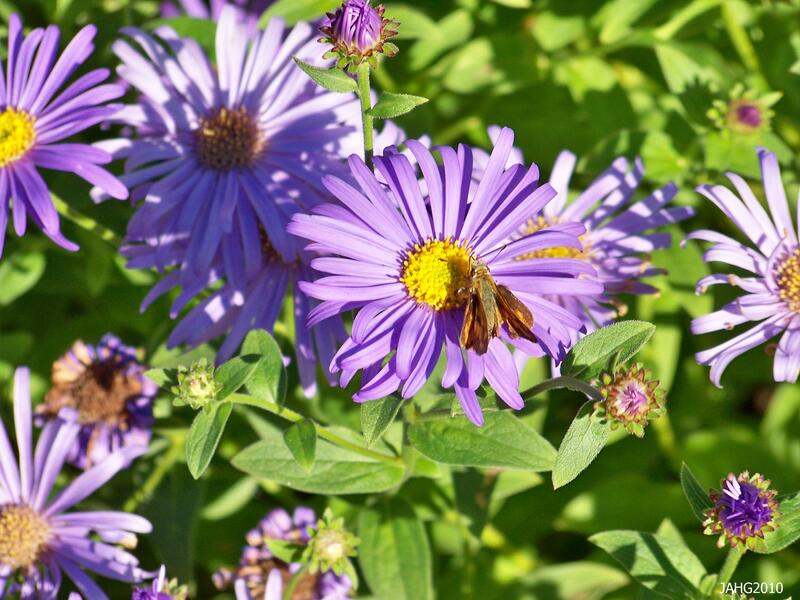 Gardeners are starting to remove spent annuals and cut down yellowing and bedraggled perennials. 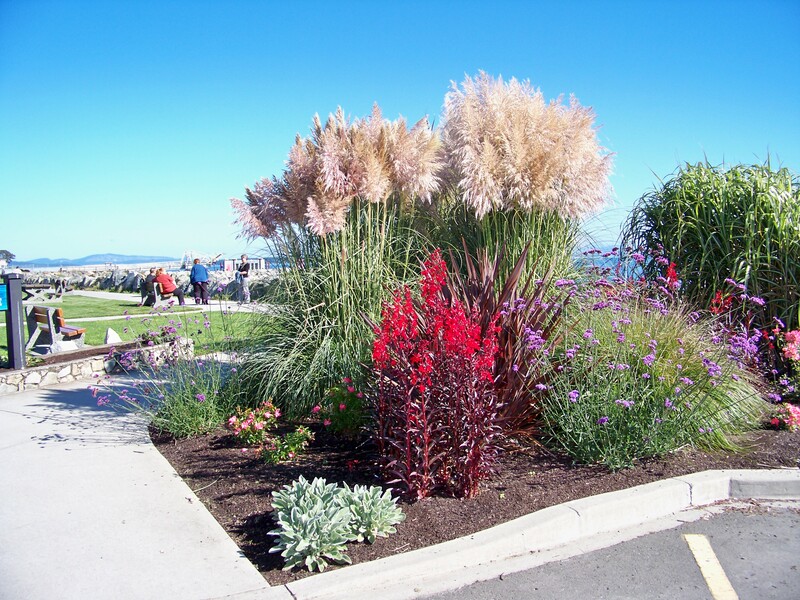 Some grasses such as Miscanthus are blooming while others are finnished waitng for the winter rains. Several plants are blooming as it is coming into thier summer, these are some of the bulbs from South Africa. One of the most showy is Nerine bowdenii (Guernsey Lily) and how beautiful it is. The pink coloring of Nerine bowdenii makes it a favorite flower amoung many who grow it. 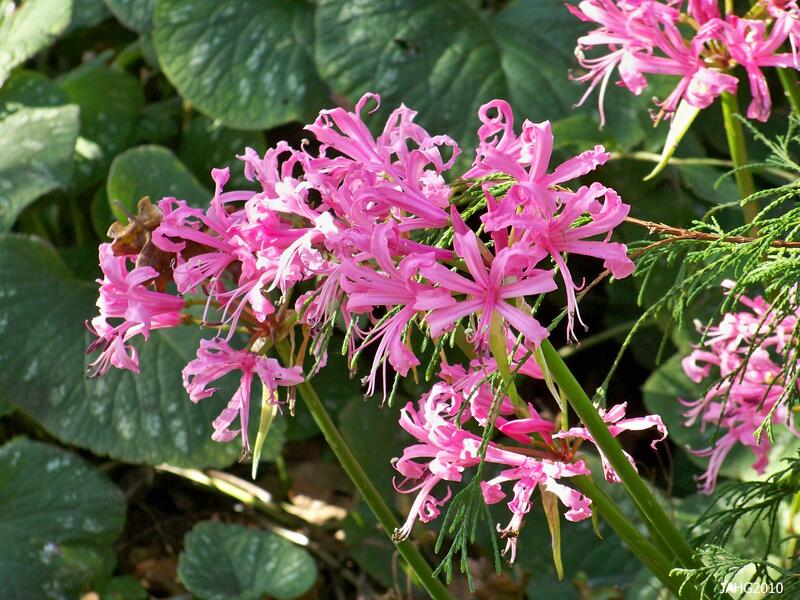 Nerines are all found in Africa with 23 0f the species found in South Africa. 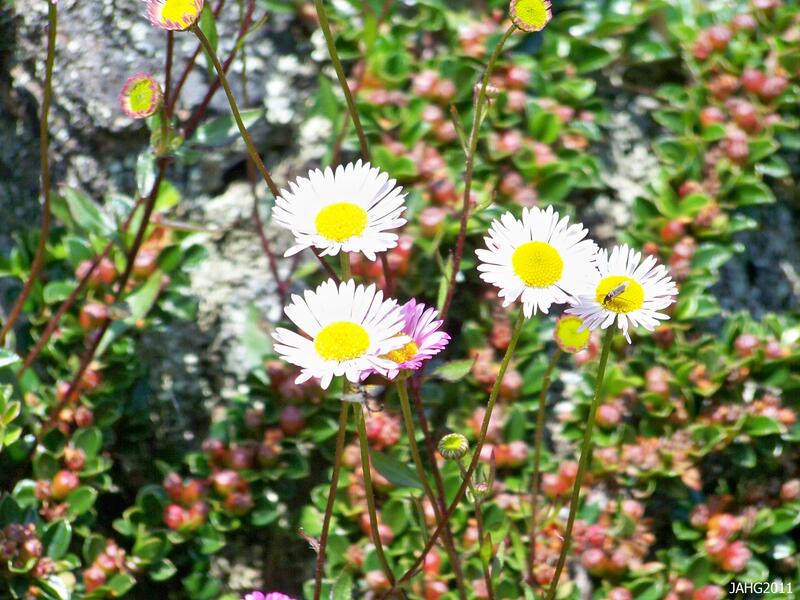 There is some confusion as to exactly how many species there ranging between 25 and 30. 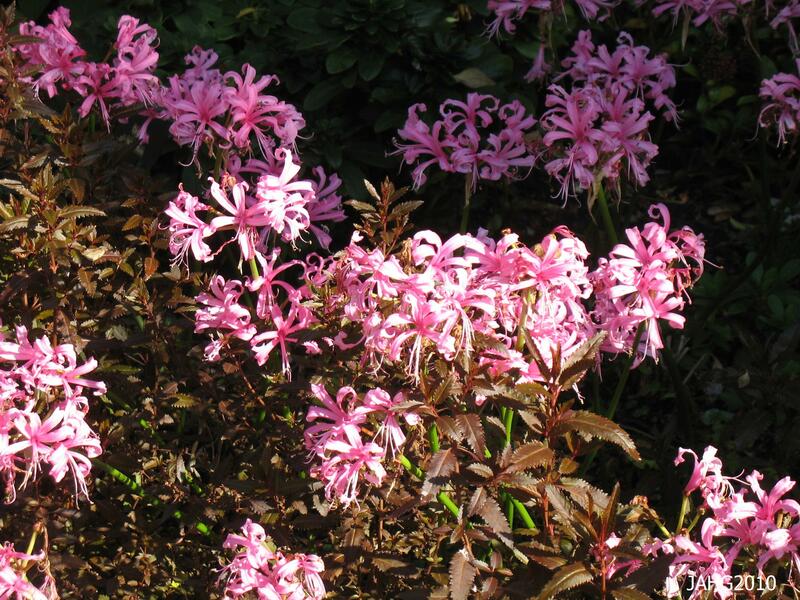 We do know the plant Nerine is named for the Greek word ‘Nereis’ for sea nymph. Bowdenii comes from Athelstan Hall Cornish Bowden (1871-1942) who was born in Devon and went on to become the Government Land Surveyor of the Cape Colony which later became South Africa. In 1903 he brought his namesake plant back to England. 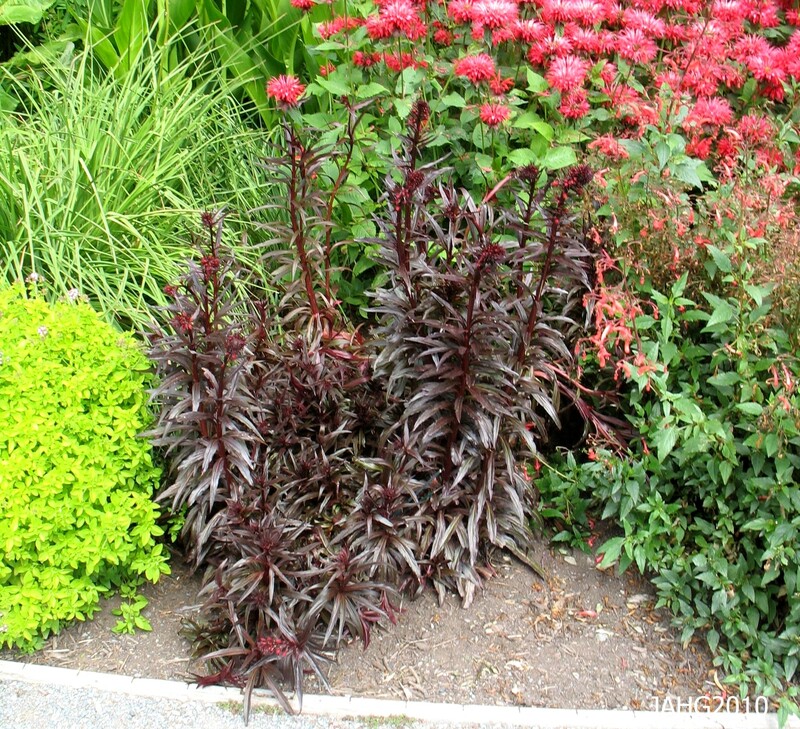 The strap-like foliage of these Nerine bowdenii bulbs is blended in with Acorus leaves. 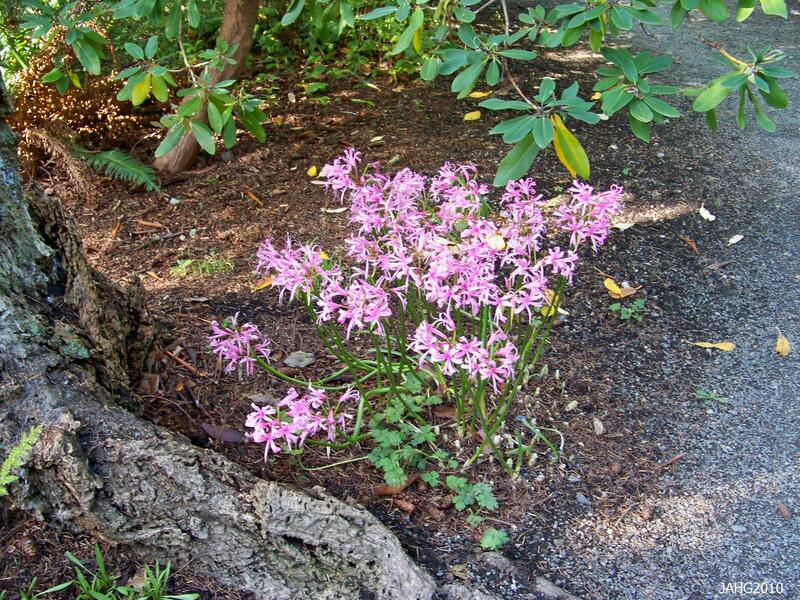 Nerine bowdenii is considered to be the most hardy of the known Nerine species. This is because it was originally found high(3000m or nearly 10000 ft.) in the Drakensburg Mountains in north Natal. There it flowers in February to May. 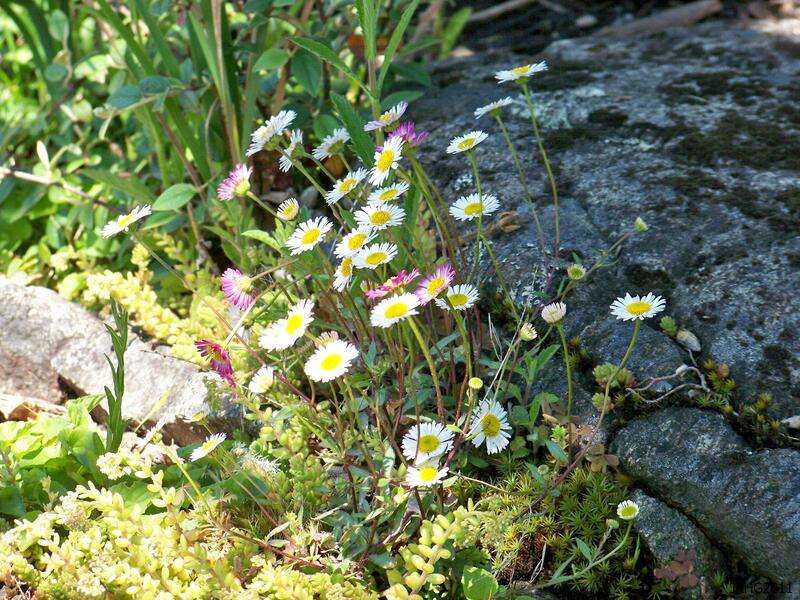 It is often found growing in cracks of the stony cliffs and where a little soil and leaf mold has accumulated over time. Nerine bowdenii is perfectly planted in the stony outcropping of the 'Terrace Gardens' at Government House in Victoria. 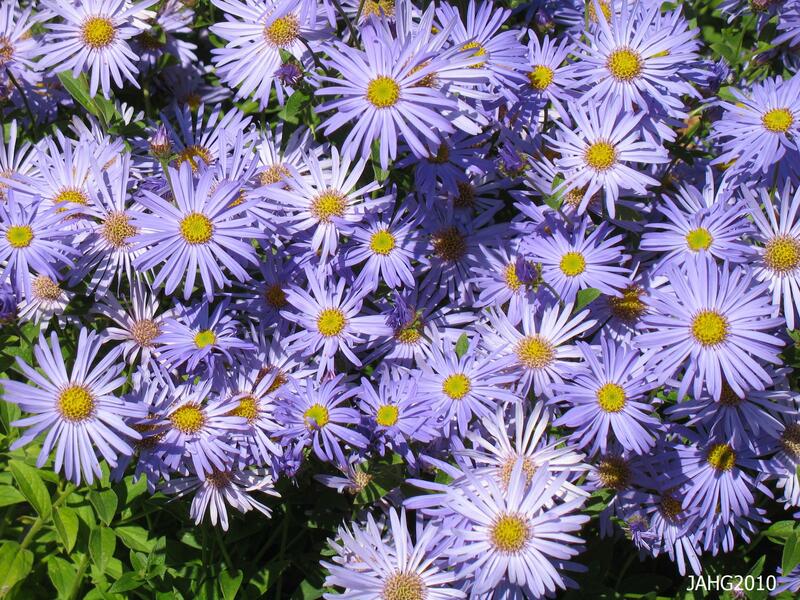 Many South African plants are relatively new to gardening and have been thought to be more tender than they have turned out to be. 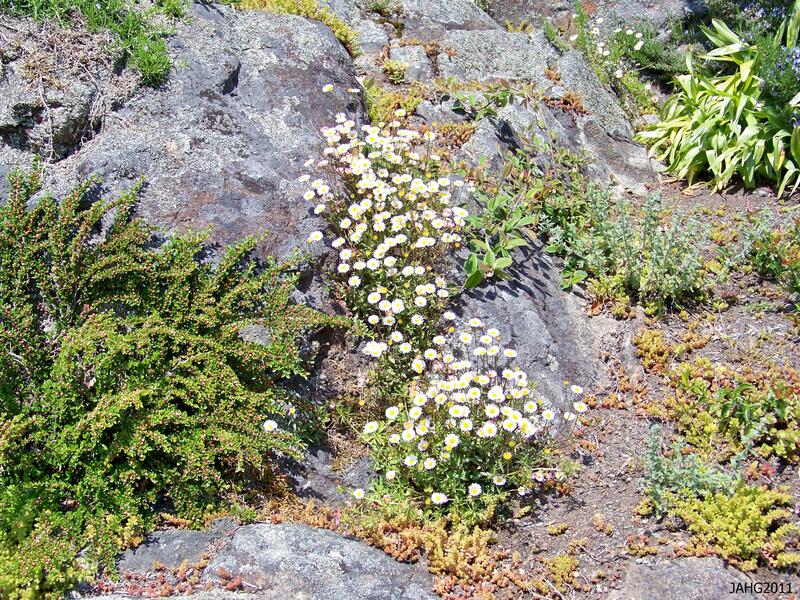 Here in Victoria and in the southern corner of British Columbia we have a very similar climate to parts of South Africa and have been lucky to enjoy a wide range of interesting plants which grow there. 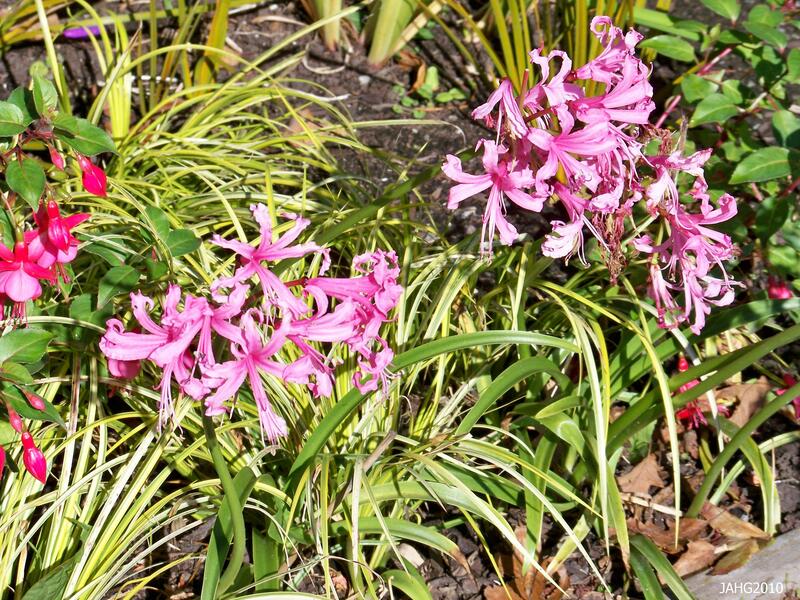 We have a mild winter which is damp and warm to hot summers with a prolonged drought which is perfect for many bulbs such as Nerine bowdenii. This clump of Nerine bowdenii is in the dappled shade at Finnerty Gardens. 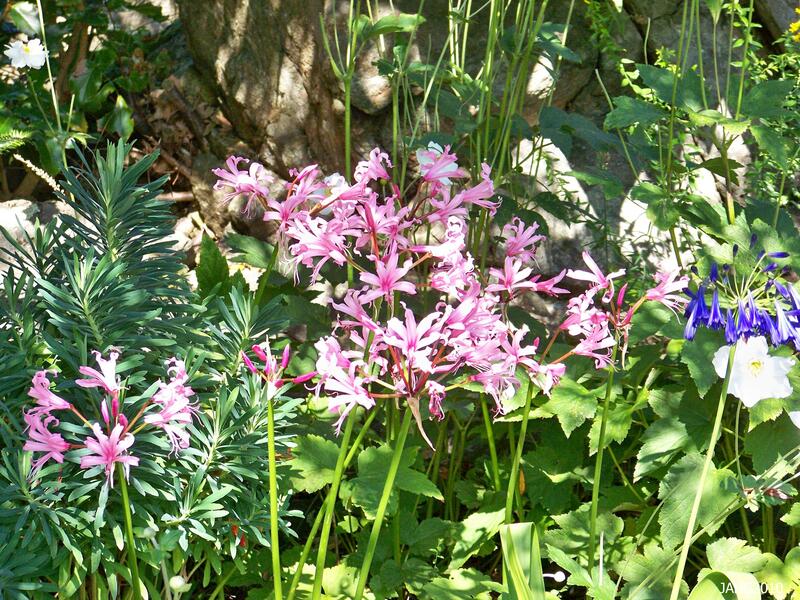 Nerine bowdenii is a fairly easy and adaptable plant to grow. Plant the bulbs close together with part of the bulb exposed like it is found in the wild. Grow it in any rich soil with good drainage so the bulbs do not sit it overly wet soil for long periods. When planting bulbs it is a good idea to add some bone meal for development of strong healthy roots. It is said that this species of Nerine can take -10(14f) temperatures easily. 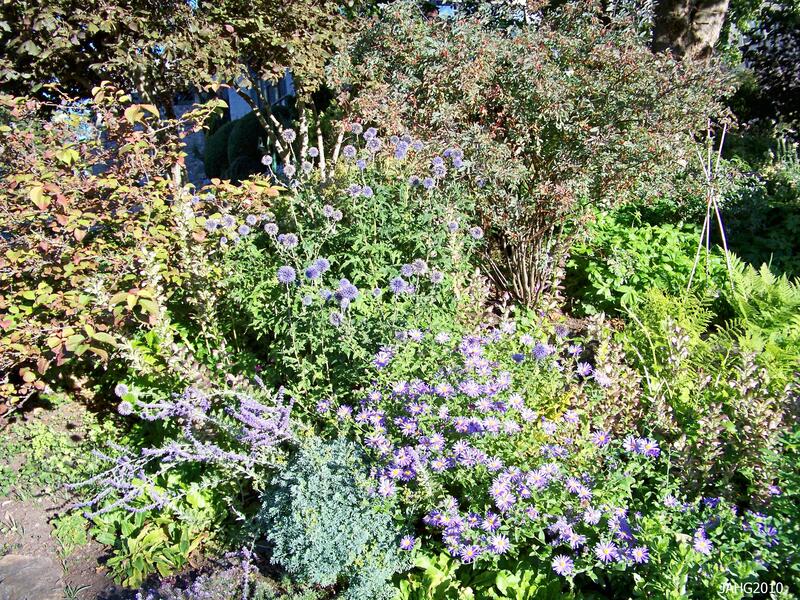 If you live in a colder climate grow your plants in a container which you may choose to sink into the ground and lift late in the fall to over-winter inside. 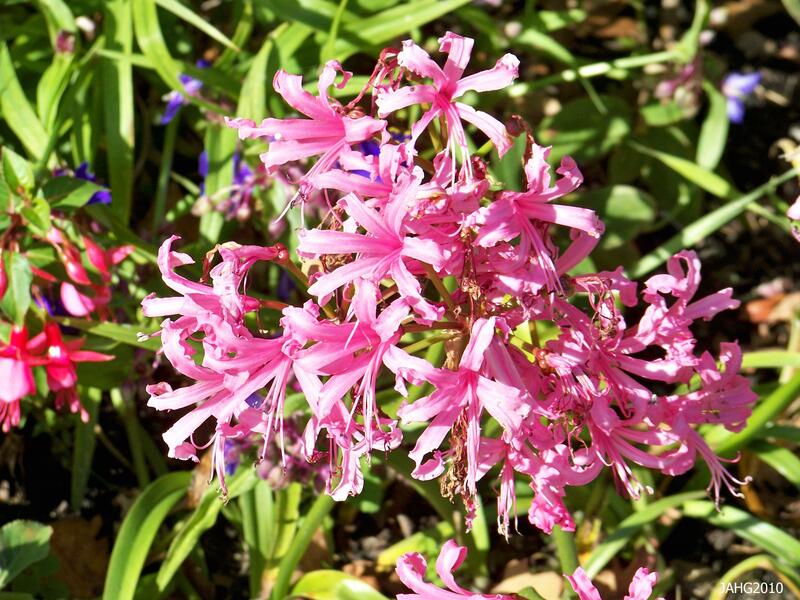 The typical Nerine bowdenii floral scape has up to a dozen flowers which are usually in a pink shade. Several named selects can be found of Nerine bowdenii which are in pink shades as well as a white form. 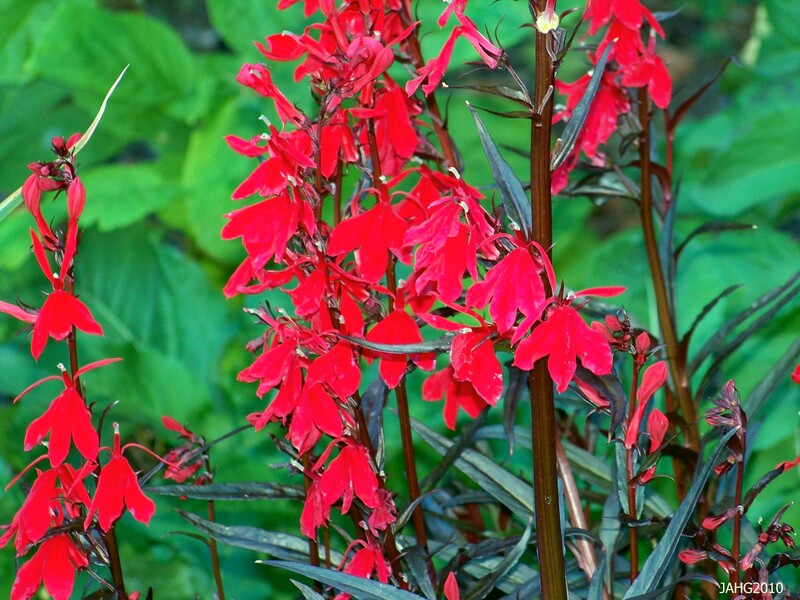 This plant is about 60cm(2ft) tall and has proved to be an excellent long lasting cut flower. The strap-like foliage is similar to that of Agapanthus and is an attractive mid green color. Propagation is by division of the bulbs or planting the fleshy seeds as soon as they become ripe. From seed to blooming bulb takes up to 6 years. The bright pink Nerine bowdenii flowers against the maroon shades of this foliage is quite spectacular. It’s a Strawberry Tree You Say? When I was in school I often learned one than one genus and from that point there can be many subspecies and hybrids. 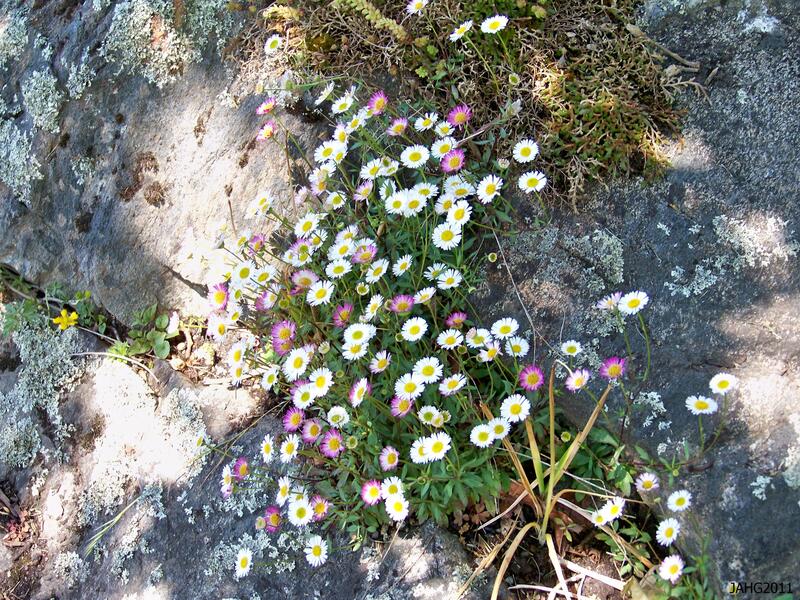 Often plants from a genus look very similar and other times do not. One genus we learned was Arbutus. Arbutus menziesii is a tree and Arbutus unedo which is a shrub. 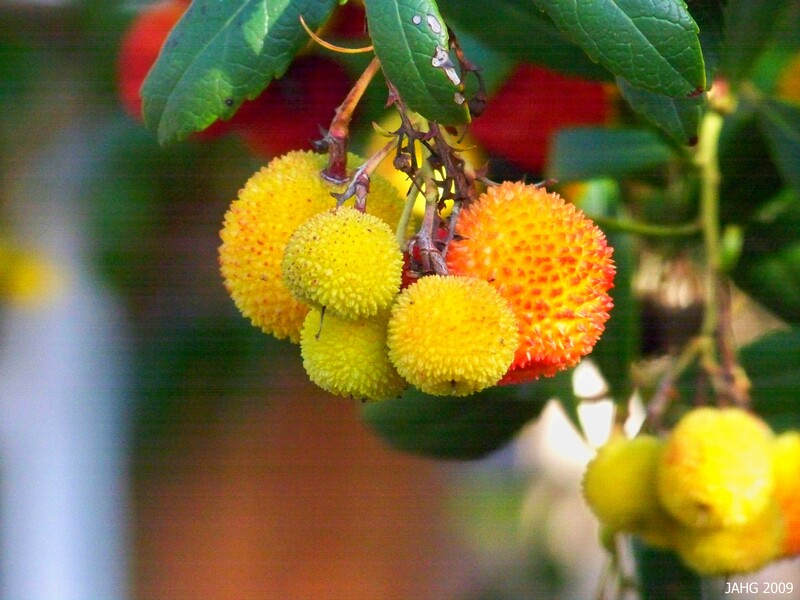 Arbutus unedo or the Strawberry tree is a great shrub which is well adapted for use here it the Victoria area. An attractive Arbutus unedo at a driveway entrance. Arbutus unedo come from the Mediterranean area and range from Turkey, Lebanon through to western areas of France and Spain and Portugal. They are also found in south western Ireland and are believed to be pre-glaciation remnants of the range where these plant originally lived. The area which Strawberry trees or more commonly bushes are found in the wild has drastically shrunk do to harvesting of the wood for manufacturing of charcoal. A happy Arbutus unedo which is loaded with fruit. Arbutus unedo or as they are known in Ireleand as Killarney Strawberry Trees are viewed as 4 season plants as they have beautiful evergreen foliage which looks good throughout the year, berries which are take a year to for and ripen and flowers which bloom late in the year when little else is. The small waxy blosoms of Arbutus unedo bloom from October through December here. Right now there are still some flowers on many bushes and crops of fruit are coloring up in a most attractive way for the Christmas season. 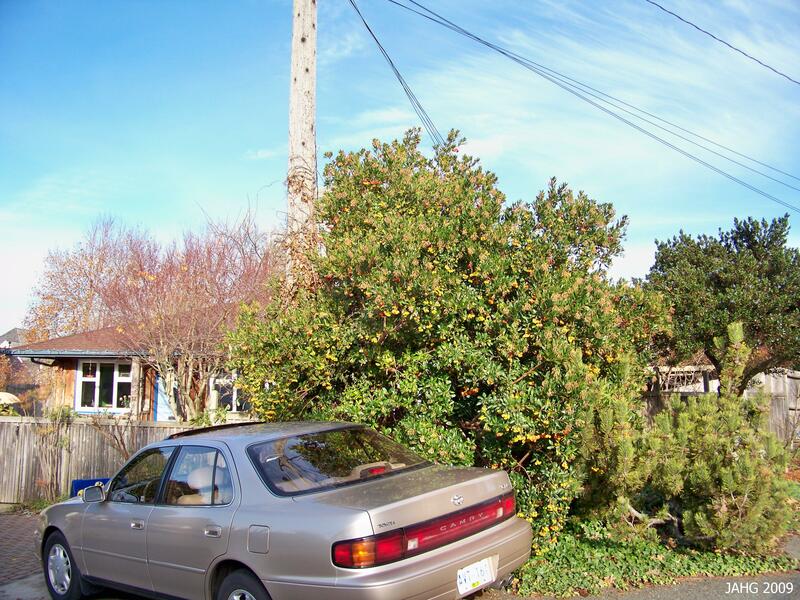 The shrub in the above picture is covered with fruit which suggests it is in a perfect location. The fruit are actually aggregate drupes which have a pasty bland flavor. The fruit is now used to make jams, jellies and a strong Brandy type drink (Medronho) which is made in Portugal. Pliny the Elder felt that the fruit was not worth eating, he wrote in 50 A.D. ‘unum edo’ – ‘I eat one’ which said to be where we get unedo. the name Arbutus is from their original Latin name. The fruits of Arbutus unedo are brightly colored and unusual looking. 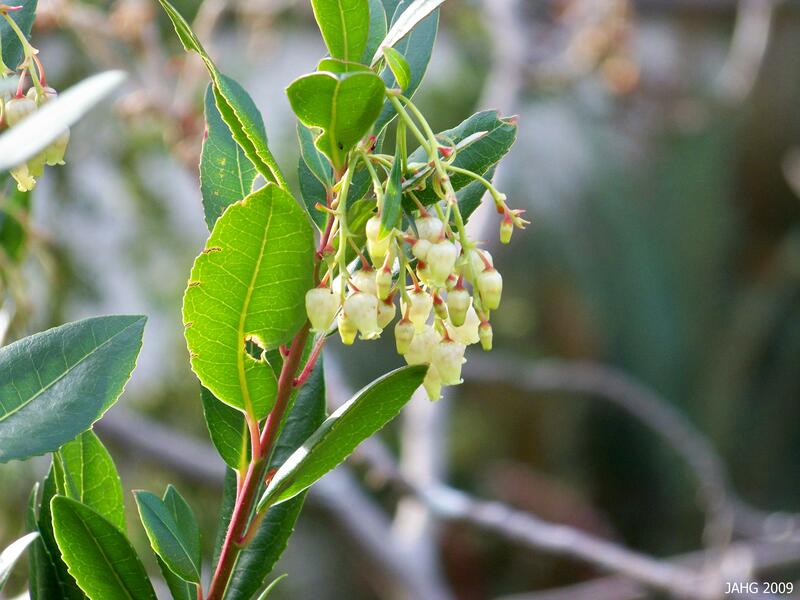 Arbutus are members of the Ericaceae family which tend to need acidic soil to grow their very best. Strawberry trees are and exception to this rule and tolerate limey soil very well and are found in France growing in sandy locations. 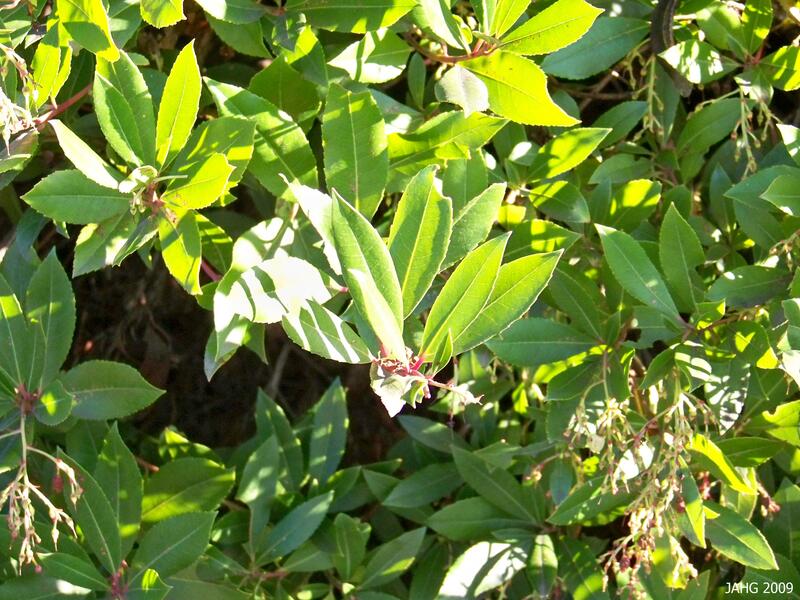 Generally here Arbutus unedo are grown as shrubs, they can be trained as a tree which is achieved by removing the lower branches as they bud out. The bark is an attractive cinnamon color and is cracked and is said to come off in strips in larger trunks, I have not seen this. 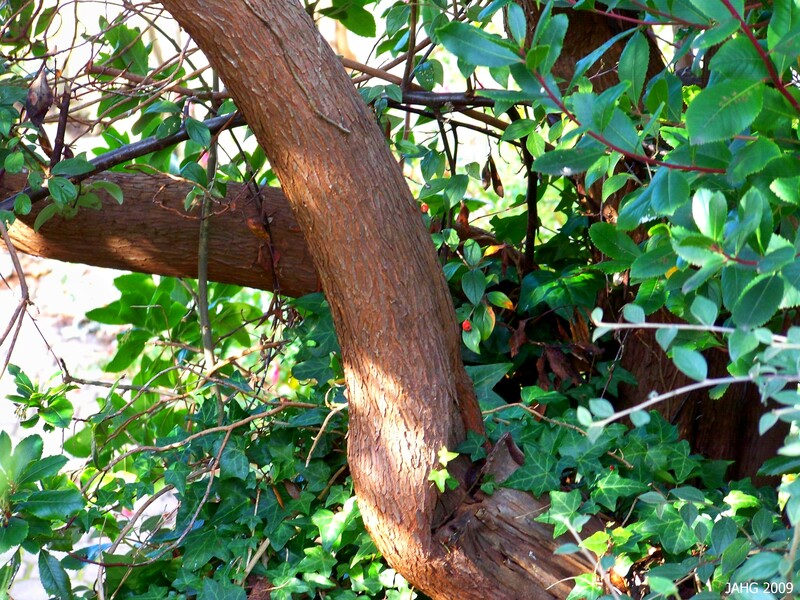 The attractive bark on this very large Arbutus unedo branch. 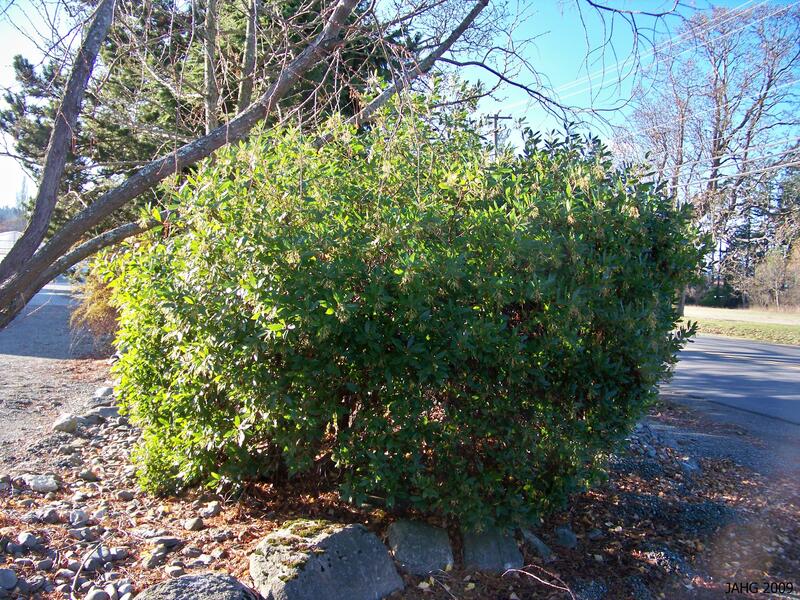 Although we usually see Arbutus unedo as shapely rounded shrubs, they can grow to be quite large. They grow to 10.5m(33ft) tall by the same spread and can grow very large trunks. 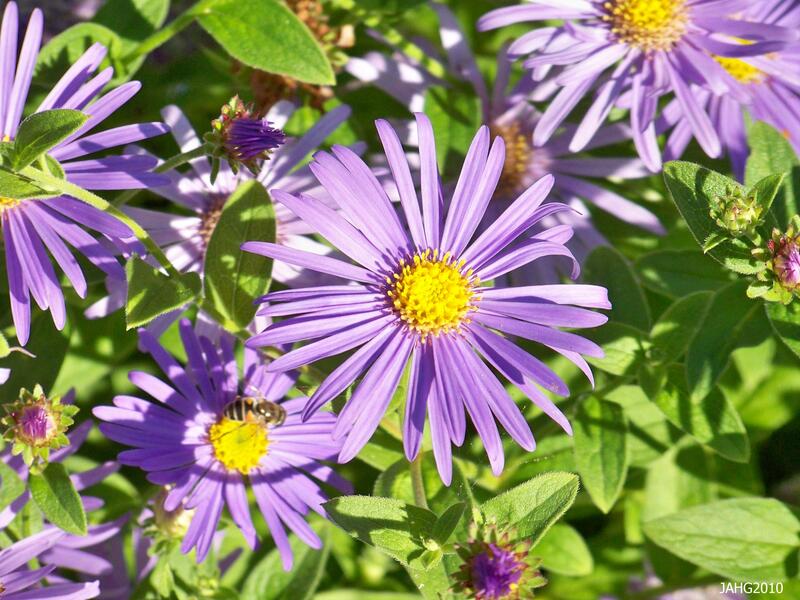 In a perfect setting they have full exposure to sun and very well drained soil. 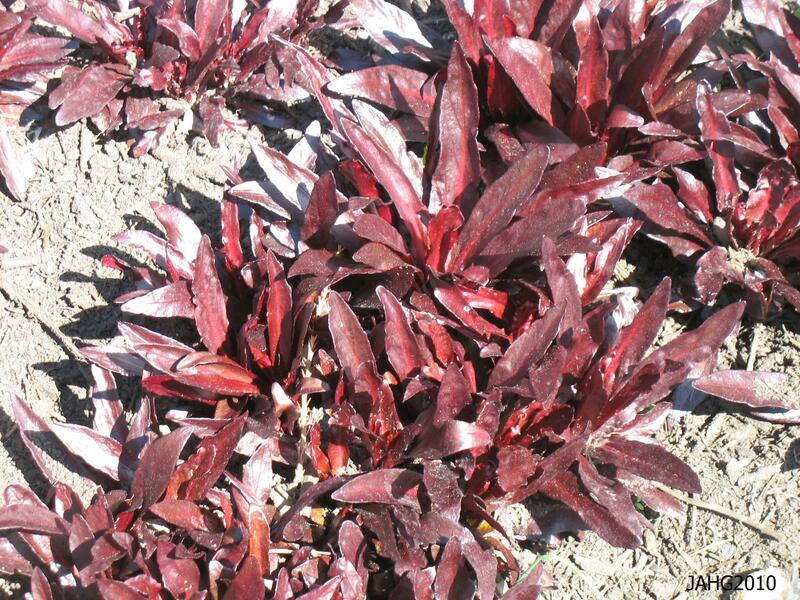 They can also do very well in wetter climates as long as the soil is very well drained, they do not tolerate being in overly damps soil. They are naturally adapted to dry summers and develop long taproots soon after they are established. The taproot mean you have to be careful about where you are planting this plant as they do not do well if they are moved later on. 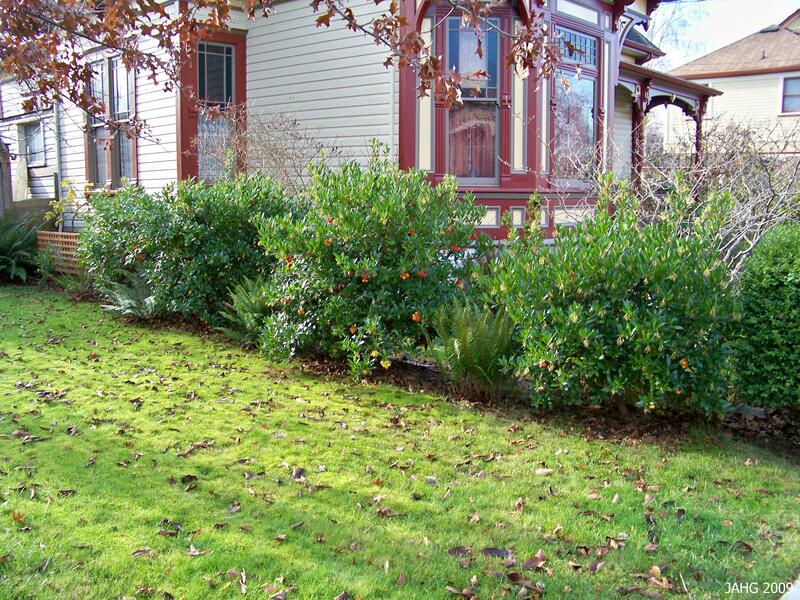 These Arbutus unedo have been planted to form a hedge which can be infomal or formal with pruning. Arbutus unedo are versatile and can be used as formal or informal hedging, specimens or back ground shrubs. 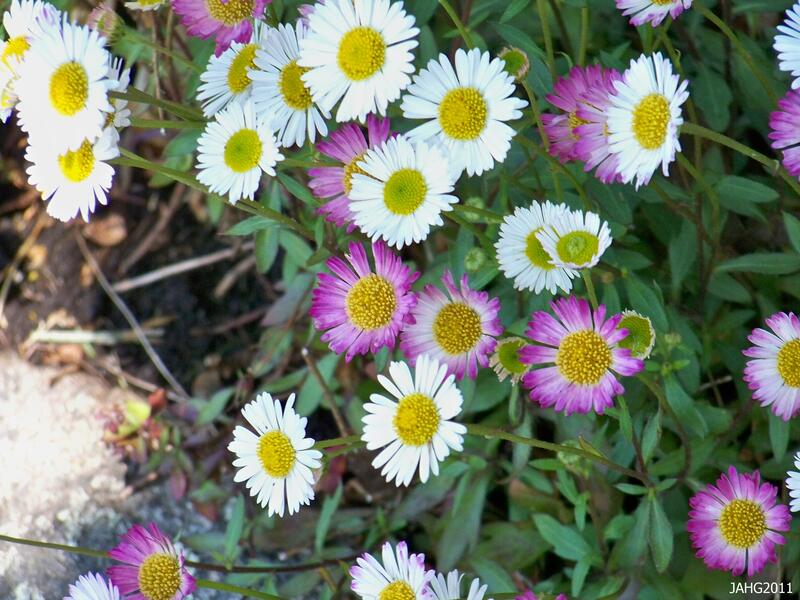 They are great in more neglected locations such as on driveways and areas which are not near water sources. The fruit will attract birds who will eat it. 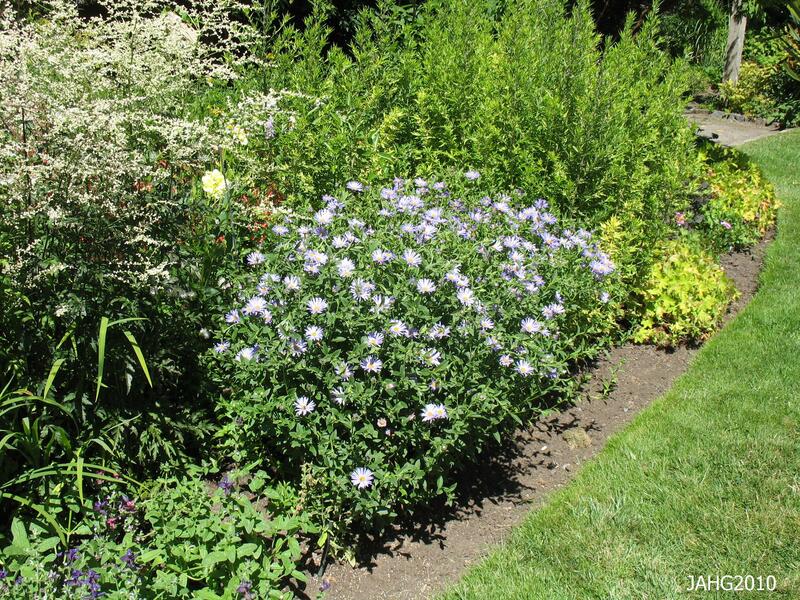 There are few pests and diseases and these can be avoided with proper care of the plant. 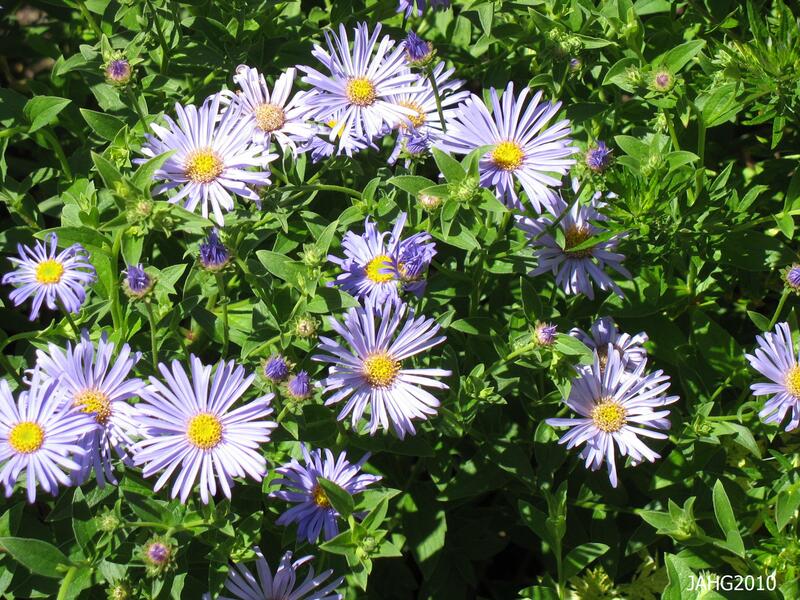 These plants are rated at zones 7 through 10 (0-10f or -7 to-12c).The leaves can be damaged by cold dry snaps such as what we had last winter, the plants I see around here where not damaged at all. A Strawberry tree is seen on the city crest of Madrid Spain. The foliage of Arbutus unedo is clean and attractive. 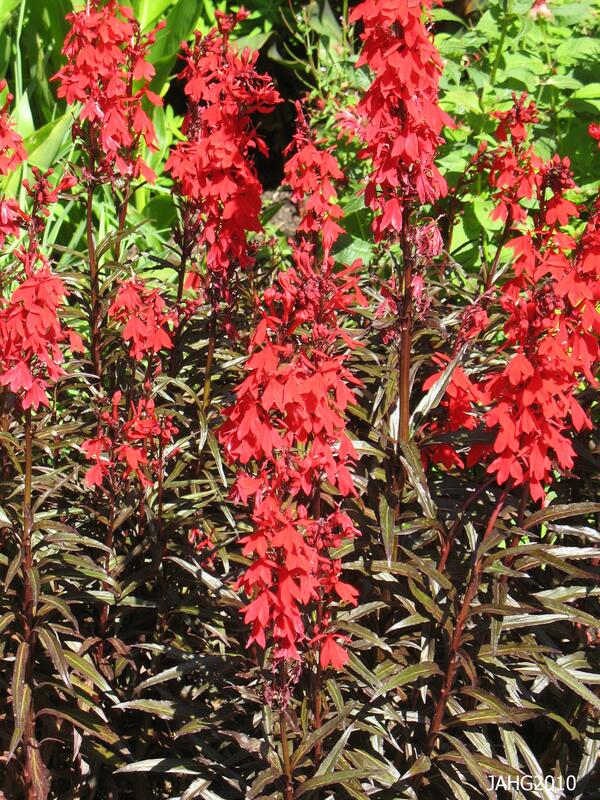 There are several attractive forms which can be found in nurseries; ‘Elfin King’ is often sold as ‘Compacta’ and has white flowers and ‘Rubra’ is pink blooming.